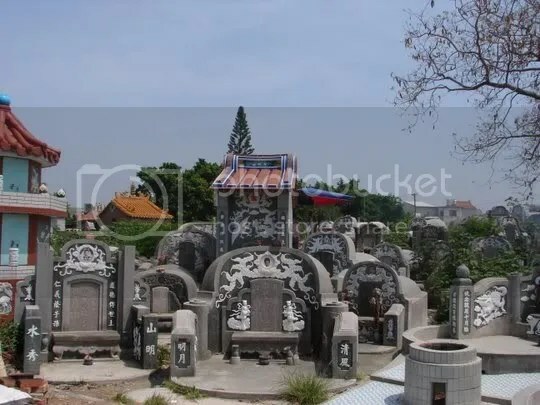 We had Friday off this weekend, because it was Ching Ming Jie, the grave-sweeping day when people traditionally feed up their ancestors and clean their graves. My family doesn’t seem to be particularly observant of this holiday, perhaps due to a generally Christian orientation. We made a speedy visit to our bong tzu (ETA: My mother tells me bong tzu basically means house of the dead in Taiwanese– for the longest time I thought it was the name of the area our little house of the dead resides in, but it’s a generic term that can apply to graves, tombs, etc.) right before I was spirited back to Taipei. This is where the ashes rest. 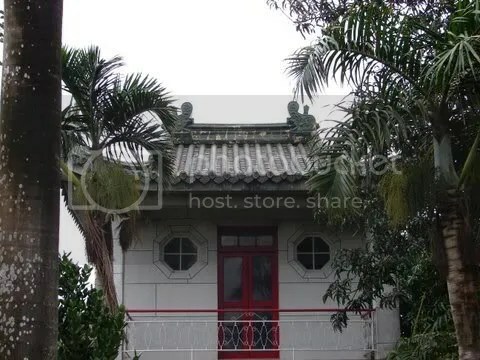 There are also old graves next to this little house of the dead that are over a hundred years old of our first family member who came to Taiwan from China long long ago. My family’s bong-tzu is by a couple of rivers and we used to have to get off by the highway and climb a rusty, falling-apart skeleton of a train bridge across the first river. I distinctly remember visiting on one of our first visits to Taiwan, seeing the rainbow scum of oil on the water, a dead fish floating by all in-between the railroad ties that I gingerly stepped on, wishing there was at least something of a railing to hold onto. The heavy scent of decay that clung to the oozing water. My mother told me they used to fish in it. Since then, the bridge has been torn down, and we have crossed through a different way from a new road, past the fiercely barking dog of the local farmer, following the leftover rails from the trains that used to take sugarcane from the fields to the factory. When my cousin visited last summer, he had to carefully make his way over a floating bridge made of styrofoam tied together. Then there is the walk through the high grasses with their seeds all a-stickle, clinging to our pant legs. We always return though. Inside the ashes of our ancestors lie on step-shelves– the kind that people display awards or trophies on. They are lined up inside sealed wooden boxes with their names burned into the side facing us. We sign the little book with the date to show we were there, and then bow three times and remember them. My grandfather filled the corridors of the house with the sound of his wooden slippers clacking on the mottled stone floors. My grandmother spraying an arc of water from an orange hose to tend her flowers. My great-grandfather prized his orchids. My great-grandmother’s voice slightly shrill as she repeated dinh, “sweet” over and over for me as we popped long-yen (dragon’s eye or longan) into our mouths. My fourth uncle, soft-spoken, who gave me a dress with a white mouse on it, and a red frilly dress when I was four and horribly vain. For a few moments in that tiny house of the dead, we keep them company, offering them our flowers and that bittersweet mix of love and sadness at the spaces they left outside of their small wooden boxes and that silent little house. Three puppies with the flexibility of the newly-born slept in my lap. I fed the dog and ended up scattering dog food all over the courtyard because… um, her head got in the way (her head was in the bowl impeding more food from going into it). I sampled shrimp chips and bought perhaps a few too many bags. I ate the best shao long bao EVER. We wandered in the companionable cool evening past the oldest temple to Matsu and sat in a Japanese garden next to a large department store. A very kind security guard let me use his phone (because as is usual, when I actually mean to use mine and NEED to use mine, it and the battery lounging in my bag were both dead) so I could be spared the 50-minute wander through the vaguely familiar environs with a map that showed me where I wanted to go, but which sort of left me lost when it came to figuring out where I actually was. He also saved me from being overcharged by the hungry taxi drivers who alternately made me feel like the most popular girl at the ball and an overdue lunch. A helmet perched on my head at a drunken angle, bumping into the helmet of my aunt in front of me as we careened home on the back of her scooter. When we got there, it had slid down my head so it looked vaguely like a cartoon head-bump. And… I couldn’t get it off without my aunt’s assistance. I hopped up the curl of a narrow stairway to the top of the tower where breezes blew through vents in the windows. I made the acquaintance of banyan trees sprawling through the roof and windows of ancient storage houses. My cousins and I got to chat for a couple minutes about the limbo of future plans before a shout and cry drew us to the children spreading flower foam dust in the living room and getting their hands on the closed utility knife. I arranged flowers with my aunt and brought them to the section of shelves where my fourth uncle’s ashes are kept in a sealed wood box gently illuminated by the twilight that turned the palm trees to shadows.